Display a temporary message that can be dismissed using a button or automatically after a period of time. A transient message is a message that is displayed for a short time and then automatically is hidden (unless the user dismisses the message early, by clicking a close button). Transient messages are used extensively by Google in their applications (for example in the GMail web and mobile applications). In the two images below, the transient messages in the Gmail web and mobile application are shown. inside-existing-transient-message - used when you want to display a transient message in the same window as another transient message. For example, an initial transient message might have the text Working.. and then you might want to replace that message with another message saying Operation complete. The message window height (in pixels). Leave blank or set to <Default> to use the default height. The default height is just enough to accommodate the message text and any buttons (if any). Distance in pixels from the top or bottom of the screen. Distance in pixels from the left or right edge of the screen. Options are Google, Default, Custom. If you select Google, the transient message styling is similar to styling used by Google in their applications. Default styles the transient message based on the currently selected component style (e.g. Alpha, MobBlue, etc.). Custom allows you to specify a CSS class and in-line style for the message window. (Optional). 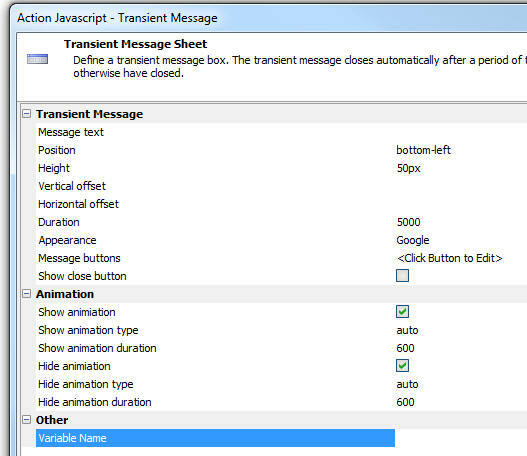 Specify that name of a variable that will be set when the transient message is shown. This variable will contain the name of the window in which the transient message is shown. This option is only used if a subsequent transient message is shown with a position of inside-existing-transient-message.